This document explains the steps required to get all SalesforceObject using GetAllSalesforceObjects processor. Gets all the available Salesforce objects. Updates output file name in flowfile attribute. Stores flowfile content in given output directory. Publishes data source to the dashboard application. 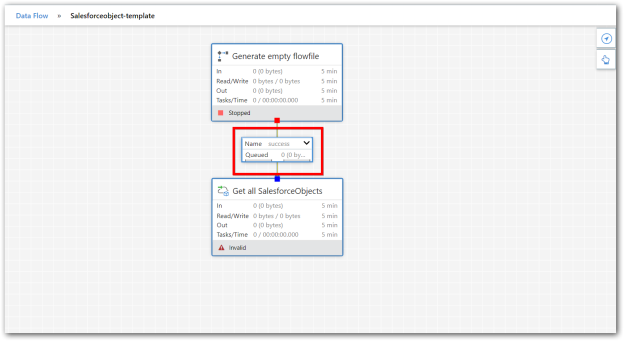 In this sample, GenerateFlowFile generates empty flowfile. GetAllSalesforceObjects processor will get all Salesforce objects and update it in generated flowfile. UpdateAttribute processor updates the file name in flowfile attribute. Finally, PutFile processor stores the transformed content in given output directory with given specific name. Step 1: Drag and drop the GenerateFlowFile processor to the workarea. Double click the processor and choose “SETTINGS” tab in configure dialog. Rename processor name as per your requirement in Name field. 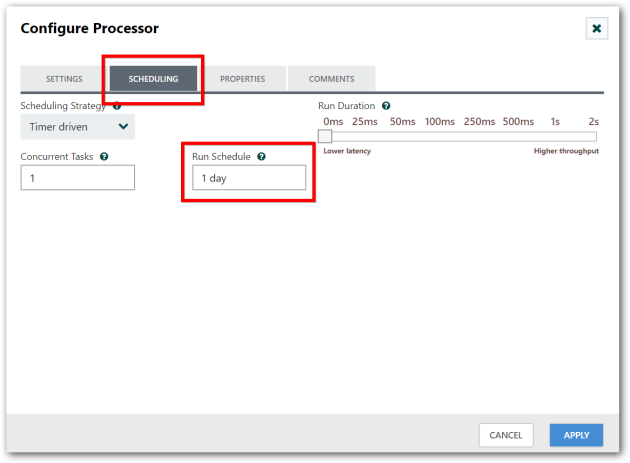 Choose “SCHEDULING” in configure dialog. Change the “Run Schedule” field as per your need. For example: 1 day, 1 hour, 5 minutes, 30 seconds. In our sample, we used 1 day. 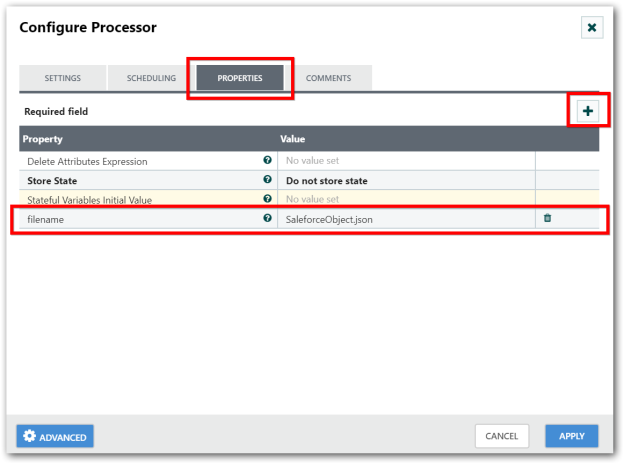 Step 2: Drag and drop the GetAllSalesforceObjects processor to the workarea. Double click the processor and choose the “PROPERTIES” tab in configure dialog. 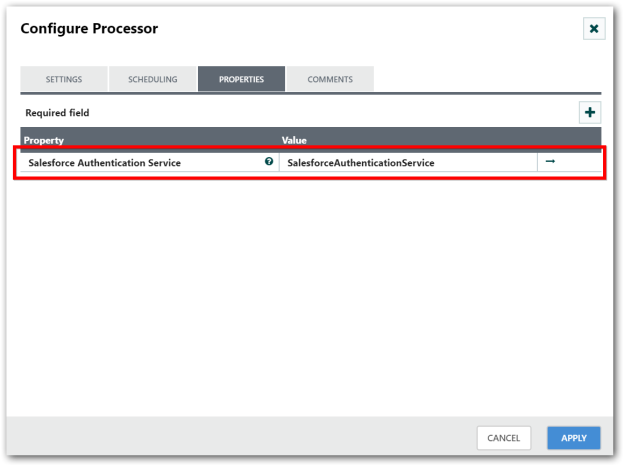 Add SalesforceAuthenticationService controller service as shown in following screenshot. Then, make connection between GenerateFlowFile and GetAllSalesforceObjects processor with success relationship. 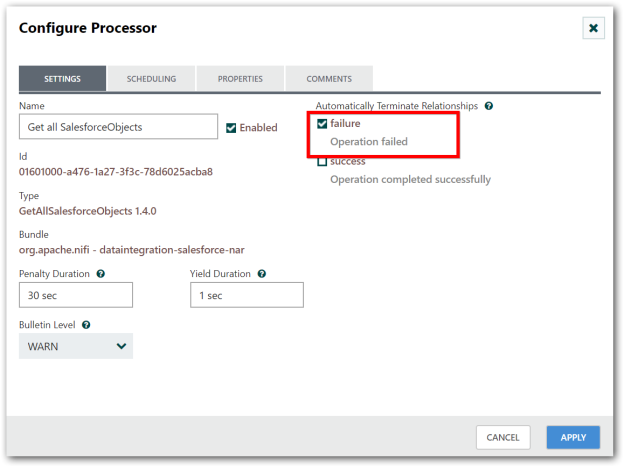 Note: If you want to ignore failure relationship, auto terminate the failure relationship in configuration popup as shown in the following screenshot. Step 3: Drag and drop the UpdateAttribute processor to the workarea. Double click the processor and choose “PROPERTIES” tab in configure dialog. Using Add button add new attribute “filename”, enter the required filename with specific file format as its value. Then, make connection between GetAllSalesforceObjects and UpdateAttribute processor with success relationship. 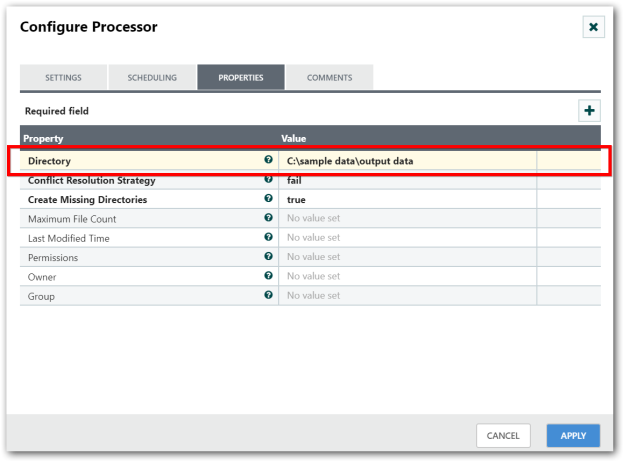 Step 4: Add PutFile processor and configure the required property fields in configuration dialog. Make connection between UpdateAttribute and PutFile processor with success relationship. Step 5: Once all the processors are configured, start the workflow. Note: In this sample, the required properties which appears in bold under properties tab, you must fill those fields with necessary value. Other properties (not in bold) are considered optional.